The genome contains all the genetic information of a given organism. Decoding the genome therefore provides the molecular basis for understanding every biological phenomenon. Since the turn of the 21st century, genomes of various metazoans have been sequenced, and consequently studies progressed efficiently in the fields of evolutionary biology, developmental biology, and environmental biology. The objective of the Marine Genomic Unit (MGU) is to pursue research in the realm of genome-based biological sciences by decoding the genomes of target marine invertebrates so as to comprehensively elucidate the molecular mechanisms underlying (a) development and evolution of marine invertebrates, (b) environmental responses of corals, and (c) specific functions of marine organisms. In 2011 we have decoded genome of the coral Acroporal digitifera, and in 2013 we succeeded in decoding the genome of a zooxanthella (coral-symbiotic brown algae), Symbiodinium minutum. 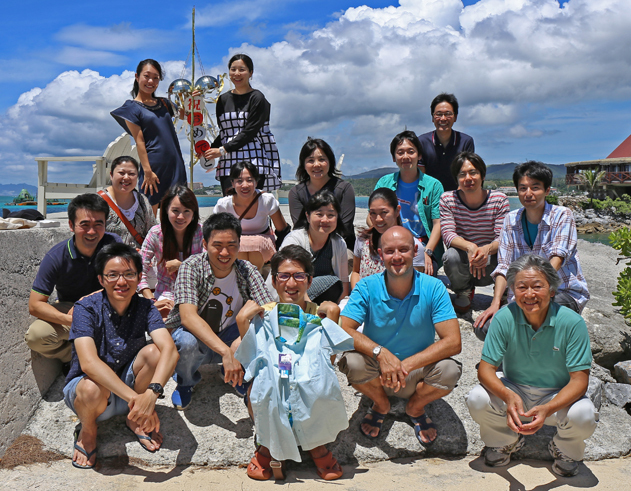 OIST-MGU is therefore a lab in which the genomes of both coral and Symbiodinium have been sequenced. In addition, we have decoded genomes of the pearl oyster Pinctada fucata in 2012 and an anhydrobiotic midge with an extreme desiccation-tolerance ability in 2014. We are proud of deciphering two metazoan genomes in fiscal year 2015; one is hemichordate genomes and the other is a brachiopod genome. In this year, we also advanced population genetics of Acropora corals in the Okinawa islands. We are interested in the origins and evolution of chordates. Chordates consist of three taxa, cephalochordates, urochordates, and vertebrates. Chordates are also a group of deuterostomes together with echinoderms and hemichordates. We believe that genome information provides basis for future studies of the origins and evolution of chordates. With such aim, we decoded genomes of a urochordate, Ciona intestinalis, in 2002 (Science 298: 2157-2167) and a cephalochordate, Branchiostoma floridae, in 2008 (Nature 453: 1064-1071). Since the sea urchin genome sequence consortium decoded the Strongylocentrotus purpuratus genome in 2006, hemichordates are deuterostomes of which genome remains to be sequenced. In collaboration with researchers of UC Berkeley and other University, we have finally decoded the genome of two acorn worms, Saccoglossus kowalevskii and Ptychodera flava. Thus, we have now obtained genomic information of all of the five deuterostome taxa. The hemichordate genome tells us what deuterostomes are. We also deciphered a brachiopod genome. The coral reefs of the Okinawa islands are amongst the most biologically diverse ecosystems in the world. The key organisms in their establishment, the scleractinian corals, increasingly face a range of human-caused challenges including seawater temperature rises and ocean acidification. Following a global coral bleaching event in 1998, Acropora corals surrounding most of Okinawa island (OI) were devastated, although they are now gradually recovering. In contrast, the Kerama Islands (KIs) only 30 km west of OI, have continuously hosted a great variety of healthy corals. We deciphered the 420-Mbp-long genome of the coral Acropora digitifera in 2011. This year, using the genomic information, we analyzed at single nucleotid polymorphism (SNP) level how the OI population has recovered, and we obtained interesting results. Dinoflagellates are unicellular marine and freshwater eukaryotes. They possess large nuclear genomes (1.5–245 gigabases) and produce structurally unique and biologically active polyketide secondary metabolites. Aforementioned, we have decoded the genome of a coral symbiont, Symbiodinium minutum nuclear genome, for the first time in the word (Curr. Biol. 23: 1399-1408, 2013). Together with transcriptomic data, this year we have investigated the assembled S. minutum genome and identified 25 candidate polyketide synthase (PKS) genes that encode proteins with mono- and multifunctional domains. Predicted proteins retain functionally important amino acids in the catalytic ketosynthase (KS) domain. Molecular phylogenetic analyses of KS domains form a clade in which S. minutum domains cluster within the protist Type I PKS clade. Acorn worms, also known as enteropneust (literally, ‘gut-breathing’) hemichordates, are marine invertebrates that share features with echinoderms and chordates. Together, these three phyla comprise the deuterostomes. In this year we report the draft genome sequences of two acorn worms, Saccoglossus kowalevskii and Ptychodera flava, both approximately 1-gigabase genome containing at least 18,556 and 19,270 genes, respectively (Nature 527: 459-465, 2015). By comparing them with diverse bilaterian genomes, we identify shared traits that were probably inherited from the last common deuterostome ancestor, and then explore evolutionary trajectories leading from this ancestor to hemichordates, echinoderms and chordates. The hemichordate genomes exhibit extensive conserved synteny with amphioxus and other bilaterians, and deeply conserved non-coding sequences that are candidates for conserved gene-regulatory elements. Notably, as shown in Fig. 1, hemichordates possess a deuterostome-specific genomic cluster of four ordered transcription factor genes (Nkx2.1, Nkx2.2, Pax1/9, and FoxA), the expression of which is associated with the development of pharyngeal ‘gill’ slits, the foremost morphological innovation of early deuterostomes, and is probably central to their filter-feeding lifestyle. Comparative analysis reveals numerous deuterostome-specific gene novelties, including genes found in deuterostomes and marine microbes, but not other animals. The putative functions of these genes can be linked to physiological, metabolic and developmental specializations of the filter-feeding ancestor. Figure 1. Conservation of a pharyngeal gene cluster across deuterostomes. a, Linkage and order of six genes including the four genes encoding transcription factors Nkx2.1, Nkx2.2, Pax1/9 and FoxA, and two genes encoding non-transcription factors Slc25A21 (solute transporter) and Mipol1 (mirror-image polydactyly 1 protein), which are putative ‘bystander’ genes containing regulatory elements of pax1/9 and foxA, respectively. The pairings of slc25A21 with pax1/9 and of mipol1 with foxA occur also in protostomes, indicating bilaterian ancestry. The cluster is not present in protostomes such as Lottia (Lophotrochozoa), Drosophila melanogaster, Caenorhabditis elegans (Ecdysozoa), or in the cnidarian, Nematostella. SLC25A6 (the slc25A21 paralogue on human chromosome 20) is a potential pseudogene. The dots marking A2 and A4 indicate two conserved non-coding sequences first recognized in vertebrates and amphioxus36, also present in S. kowalevskii and, partially, in P. flava and A. planci. b, The four transcription factor genes of the cluster are expressed in the pharyngeal/foregut endoderm of the Saccoglossus juvenile: nkx2.1 is expressed in a band of endoderm at the level of the forming gill pore, especially ventral and posterior to it (arrow), and in a separate ectodermal domain in the proboscis. It is also known as thyroid transcription factor 1 due to its expression in the pharyngeal thyroid rudiment in vertebrates. The nkx2.2 gene is expressed in pharyngeal endoderm just ventral to the forming gill pore, shown in side view (arrow indicates gill pore) and ventral view; and pax1/9 is expressed in the gill pore rudiment itself. In S. kowalevskii, this is its only expression domain, whereas in vertebrates it is also expressed in axial mesoderm. The foxA gene is expressed widely in endoderm but is repressed at the site of gill pore formation (arrow). An external view of gill pores is shown; up to 100 bilateral pairs are present in adults, indicative of the large size of the pharynx. Brachiopods are marine invertebrates with calcium phosphate or carbonate shells (Fig. 2). Figure 2. Deuterostomic development of the brachiopod, L. anatina, and its close relationship to molluscs. (a) Adult (shell length ~4–5 cm). (b–i) Embryogenesis: egg (b), embryos at 4-cell (c), 16-cell (d), 32-cell (e) and 128-cell stages (f), blastula (g), late gastrula (h) and 2-pair cirri larva (i). Scale bar, 50 μm. bp, blastopore; cr, cirri; ct, chaeta; gt, gut; ml, mantle lobe; mo, mouth; pd, pedicle; sh, shell; st, stone. (j) Phylogenetic position of Lingula among lophotrochozoans (orange box; molluscs are blue; annelids are green). The tree was constructed using the maximum likelihood method with 150 one-to-one orthologues (46,845 amino-acid positions) with LG+Γ4 model. Circles at all nodes indicate 100% bootstrap support. Abundant in the fossil record, Darwin first referred to lingulid brachiopods as ‘living fossils,’ because their shell morphology has changed little since the Silurian. The evolutionary origins of lingulid brachiopods and their calcium phosphate shells have been obscure. This year, we decode the 425-Mb genome of Lingula anatina to gain insights into brachiopod evolution (Nature Communication 6: 8301, 2015). Comprehensive phylogenomic analyses place Lingula close to molluscs, but distant from annelids. The Lingula gene number has increased to ~34,000 by extensive expansion of gene families. Although Lingula and vertebrates have superficially similar hard tissue components, our genomic, transcriptomic and proteomic analyses show that Lingula lacks genes involved in bone formation, indicating an independent origin of their phosphate biominerals (Fig. 3). Several genes involved in Lingula shell formation are shared by molluscs. However, Lingula has independently undergone domain combinations to produce shell matrix collagens with EGF domains and carries lineage-specific shell matrix proteins. Gene family expansion, domain shuffling and co-option of genes appear to be the genomic background of Lingula’s unique biomineralization. This Lingula genome provides resources for further studies of lophotrochozoan evolution. Figure 3. A schematic illustration of genes involved in Lingula biomineralization identified in the present study. Genes are coloured by their known functions in shell or bone formation in molluscs and vertebrates, respectively. Dashed outlines indicate gene families expanded specifically in Lingula. BMPR, bone morphogenetic protein receptor; ECM, extracellular matrix; GAG, glucosaminoglycan; SEVP1, Sushi von Willebrand factor type A, EGF and pentraxin domain-containing protein 1; WVA, von Willebrand factor type A domain containing protein. Proteins with ion-binding domains are labelled with Ca2+, Fe2+ or Cu2+. P and S in white circles indicate phosphate and sulfate groups. The coral reefs of the Okinawa islands are amongst the most biologically diverse ecosystems in the world. The key organisms in their establishment, the scleractinian corals, increasingly face a range of human-caused challenges including seawater temperature rises and ocean acidification. To understand better the molecular mechanisms underlying coral biology, we succeeded in deciphering the 420-Mbp-long genome of the coral Acropora digitifera in 2011. Following a global coral bleaching event in 1998, Acropora corals surrounding most of Okinawa island (OI) were devastated, although they are now gradually recovering. In contrast, the Kerama Islands (KIs) only 30 km west of OI, have continuously hosted a great variety of healthy corals. Taking advantage of the decoded Acropora digitifera genome and using genome-wide SNP analyses, we clarified Acropora population structure in the southern Ryukyu Archipelago (sRA) (Sci. Reports 5: 18211, 2015). Figure 4. Principal components analysis and genetic distances and suggest the existence of four clusters in the sRA, located in Okinawa, the KIs, Yaeyama North, and Yaeyama South. (a) Principal components analysis (PCA) of the filtered dataset of 122 individuals and 905,561 SNPs after trimming of related samples with smartrel and outliers with smartpca. Tracy-Widom statistical significance of PC1 and PC2 was <1e−35. Individuals from Okinawa Island, the KIs, and the YIs are shown with squares, circles, and triangles, respectively. Four subpopulations, Okinawa, Kerama, Yaeyama-North, and Yaeyama-South are circled in green, pink, blue, and purple dotted lines, respectively. (b) Heatmap showing pairwise Fst values based on Weir and Cockerham weighted estimates between sampling sites. All points were clustered by pairwise Fst values, based on the Complete Linkage Clustering method. Site combinations without boxed bold lines indicate significant differences (p-value < 0.001, ANOVA statistics across 10 eigenvectors in PCA). As shown in Fig. 4, despite small genetic distances, we identified distinct clusters corresponding to specific island groups, suggesting infrequent long-distance dispersal within the sRA. Although the KIs were believed to supply coral larvae to OI, admixture analyses showed that such dispersal is much more limited than previously realized, indicating independent recovery of OI coral populations and the necessity of local conservation efforts for each region. We detected strong historical migration from the Yaeyama Islands (YIs) to OI, and suggest that the YIs are the original source of OI corals (Fig. 5). In addition, migration edges to the KIs suggest that they are a historical sink population in the sRA, resulting in high diversity. This population genomics study provides the highest resolution data to date regarding coral population structure and history. Figure 5. Migration patterns of A. digitifera in the sRA, showing that the YI populations function as source populations for OI, while the KIs constitute a historical sink. Inferred tree of A. digitifera populations in the sRA with thirteen migration events. Migration arrows are colored according to their weight. The migration weight represents the fraction of ancestry derived from the migration edge. Migration edges with p-value estimated by jackknife to be below 0.01 are shown. Migration edges with bootstrap support less than 50% are shown with dotted lines. Horizontal branch lengths are proportional to the amount of genetic drift that has occurred in each branch. Dinoflagellates are unicellular marine and freshwater eukaryotes. They possess large nuclear genomes (1.5–245 gigabases) and produce structurally unique and biologically active polyketide secondary metabolites. Aforementioned, we have decoded the genome of a coral symbionts, Symbiodinium minutum nuclear genome, for the first time in the word (Curr. Biol. 23: 1399-1408, 2013). Together with transcriptomic analyses, we have investigated the assembled S. minutum genome and identified 25 candidate polyketide synthase (PKS) genes that encode proteins with mono- and multifunctional domains (BMC Genomics 16: 2385-2391, 2015). Predicted proteins retain functionally important amino acids in the catalytic ketosynthase (KS) domain. Molecular phylogenetic analyses of KS domains form a clade in which S. minutum domains cluster within the protist Type I PKS clade with those of other dinoflagellates and other eukaryotes. Single-domain PKS genes are likely expanded in dinoflagellate lineage. Two PKS genes of bacterial origin are found in the S. minutum genome. Interestingly, the largest enzyme is likely expressed as a hybrid non-ribosomal peptide synthetase-polyketide synthase (NRPS-PKS) assembly of 10,601 amino acids, containing NRPS and PKS modules and a thioesterase (TE) domain. We also found intron-rich genes with the minimal set of catalytic domains needed to produce polyketides. Ketosynthase (KS), acyltransferase (AT), and acyl carrier protein (ACP) along with other optional domains are present. Mapping of transcripts to the genome with the dinoflagellate-specific spliced leader sequence, supports expression of multifunctional PKS genes. Metabolite profiling of cultured S. minutum confirmed production of zooxanthellamide D, a polyhydroxy amide polyketide and other unknown polyketide secondary metabolites. Aforementioned, this genomic survey demonstrates that S. minutum contains genes with the minimal set of catalytic domains needed to produce polyketides and provides evidence of the modular nature of Type I PKS, unlike monofunctional Type I PKS from other dinoflagellates. In addition, our study suggests that diversification of dinoflagellate PKS genes comprises dinoflagellate-specific PKS genes with single domains, multifunctional PKS genes with KS domains orthologous to those of other protists, and PKS genes of bacterial origin. Simakov, O., Kawashima, T., Marlétaz, F., Jenkins, J., Koyanagi, R., Mitros, T., Hisata, K., Bredeson, J., Shoguchi, E., Gyoja, F., Yue, J.X., Chen, Y.C., Robert M. Freeman, R.M., Sasaki, A.,Hikosaka-Katayama, T., Sato, A., Fujie, M., Baughman, K.W., Levine, J., Paul Gonzalez, P., Cameron, C., Fritzenwanker, J.H., Pani, A.M., Goto, H., Kanda, M., Arakaki, N., Yamasaki, S., Qu, J., Cree, A., Ding, Y., Dinh, H.H., Dugan, S., Holder, M., Jhangiani, S.N., Kovar, C.L., Lee, S.L., Lewis, L.R., Morton, D., Nazareth, L.V., Okwuonu, G., Santibanez, J., Chen, R., Richards, S., Muzny, D.M., Gillis, A., Peshkin, L., Wu, M., Humphreys, T., Su, Y.H., Putnam, N.H., Schmutz, J., Fujiyama, A., Yu, J.K., Tagawa, K., Worley, K.C., Gibbs, R.A., Kirschner, M.W., Christopher J. Lowe, C.J., Satoh, N., Rokhsar, D.S., Gerhart, J.
Luo, Y.J., Takeuchi, T., Koyanagi, R., Yamada, L., Kanda, M., Khalturina, M., Fujie, M., Yamasaki, S., Endo, K., Satoh, N.
The Lingula genome provides insights into brachiopod evolution and the origin of phosphate biomineralization. Kawai, N., Ogura, Y., Ikuta, T., Saiga, H., Hamada, M., Sakuma, T., Yamamoto, T., Satoh, N., Sasakura, Y.
Hox10-regulated endodermal cell migration is essential for development of the ascidian intestine. Developmental Biology, S0012-1606(15)00169-4. doi: 10.1016/j.ydbio.2015.03.018. (2015). Hamada, M., Goricki, S., Byerly, M.S., Satoh, N., Jeffery, W.R.
Kraus, J.E.M., Fredman, D., Wang, W., E., Khalturin, K., Technau, U. Adoption of conserved developmental genes in development and origin of the medusa body plan. Luo, Y.J., Satoh, N., Endo, K.
Mitochondrial gene order variation in the brachiopod Lingula anatina and its implications for mitochondrial evolution in lophotrochozoans. Alié, A., Hayashi, T., Sugimura, I., Manuel, M., Sugano, W., Mano, A., Satoh, N., Agata, K., Funayama, N.
Two decades of ascidian developmental biology: A personal research story. Maruyama, S., Shoguchi, E., Satoh, N., Minagawa, J. Diversification of light harvesting complex gene family via intra- and intergenic duplications in the coral symbiotic alga Symbiodinium. Nakajima, Y., Shinzato, C., Satoh, N., Mitarai S.
Novel Polymorphic Microsatellite Markers Reveal Genetic Differentiation between Two Sympatric Types of Galaxea fascicularis. Shoguchi, E., Shinzato, C., Hisata, K., Satoh, N., Mungpakdee, S.
The Large Mitochondrial Genome of Symbiodinium minutum Reveals Conserved Noncoding Sequences between Dinoflagellates and Apicomplexans..
Sato, A., Kawashima, T., Fujie, M., Hughes, S., Satoh, N., Shimeld, S.
Molecular basis of canalization in an ascidian species complex adapted to different thermal conditions. Shinzato, C., Mungpakdee, S., Arakaki, N., Satoh, N.
Sayavedra, L., Kleiner, M., Ponnudurai, R., Wetzel, S., Pelletier, E., Barbe, V., Satoh, N., Shoguchi, E., Fink, D., Breusing, C., Reusch, T.B., Rosenstiel, P., Schilhabel, M.B., Becher, D., Schweder, T., Markert, S., Dubilier, N, Petersen, J.M. Elife. 15;4. pii: e07966. doi: 10.7554/eLife.07966. (2015). Hosokawa, T., Ishii, Y., Nikoh, N., Fujie, M., Satoh, N., Fukatsu, T.
Obligate bacterial mutualists evolving from environmental bacteria in natural insect populations. Detree, C., Chabenat, A., Lallier, F.H., Satoh, N., Shoguchi, E., Tanguy, A., Mary, J. Multiple I-Type Lysozymes in the Hydrothermal Vent Mussel Bathymodiolus azoricus and Their Role in Symbiotic Plasticity. Nakajima, Y., Zayasu, Y., Shinzato, C., Satoh, N., Mitarai. S.
Shin-ya, K., Izumikawa, M., Kozone, I., Hashimoto, J., Kagaya, N., Takagi, M., Koiwai, H., Komatsu, M., Fujie, M., Satoh, N., Ikeda, H.
Novel thioviridamide derivative-JBIR-140-heterologous expression of the gene cluster for thioviridamide biosynthesis. Journal of Antibiotics, 68(8):533-6. doi: 10.1038/ja.2015.20. (2015). Ohno, S., Katsuyama, Y., Tajima, Y., Izumikawa, M., Takagi, M., Fujie, M., Satoh, N., Shin-ya, K., Yasuo Ohnishi, Y. Identification and characterization of the streptazone E biosynthetic gene cluster in Streptomyces sp. Beedessee, G., Hisata, K., Roy, M.C., Satoh, N., Shoguchi, E.
Ohno S, Katsuyama Y, Tajima Y, Izumikawa M, Takagi M, Fujie M, Satoh N, Shin-Ya K, Ohnishi Y. Identification and Characterization of the Streptazone E Biosynthetic Gene Cluster in Streptomyces sp. MSC090213JE08. Takeuchi, T., Koyanagi, R., Gyoja, F., Kanda, M., Hisata, K., Fujie, M., Goto, H., Yamasaki, S., Nagai, K., Morino, Y., Miyamoto, H., Endo, K., Endo, H., Nagasawa, H., Kinoshita., S., Asakawa, S., Watabe, S., Satoh, N., Kawashima, T.
Maeda, K., Tran, H.D., Tan, H.H. Discovery of a substantial continental population of the subfamily Sicydiinae (Gobioidei: Gobiidae) from Vietnam: Taxonomic revision of the genus Stiphodon from the western South China Sea. Lord C., Maeda K., Keith P., Watanabe S.
Population structure of the Asian amphidromous Sicydiinae goby, Stiphodon percnopterygionus, inferred from mitochondrial COI sequences, with comments on larval dispersal in the northwest Pacific Ocean. Maeda, K., Iida, M., Kondo, M.
Keith, P., Lord, C., and Maeda, K.